The Ministry of Health of Ukraine and Crown Agents have delivered ​a ground-breaking procurement project providing Ukrainian patients, from child- to adulthood, with medicines and medical products for oncology and oncohematology programmes. The programme was worth a total of $32 million. The procurement process, implemented during 2016, Working to the specification of the Ministry of Health of Ukraine, based on the resolution of the Cabinet of Ministers of Ukraine № 787 of October 8, 2015, Crown Agents provided 100% of the all contracted supplies within the period specified in the Agreement with MoH, December 6, 2016. March 2015– adoption of the Law on involvement of international institutions in the state medicine procurement program. January 2016– finalization of the agreement on cooperation between the Ministry of Healthcare of Ukraine and Crown Agents. February – April 2016– Ministry of Healthcare approves financial terms and the list of winners-suppliers for the adult oncology program and partially for the pediatric program too. Signing the first contracts with suppliers and provision of the first report to Ministry of Healthcare of Ukraine. April 2016– deliveries start in accordance with the approved schedule. May 2016– new tender on 18 items in accordance with the Ministry of Healthcare of Ukraine request. June 2016– 54% of the total volume and budget of medicines are delivered. 10% of medicines are delivered ahead of schedule, 7% running behind schedule. July 2016– 65% of medicines is delivered. Still expecting final confirmation from the Ministry of Healthcare of Ukraine – 3 for the child program and 17 for the adult one. August 2016– 50,34% of medicines for the child oncology program, 80,3% of medicines within the centralized procurement program for adult oncology and 48,02% of the requested reagents are delivered. September – October 2016– delivered 91,65% of contracted medicines for the child oncology program; 85,66% of contracted medicines within the centralized procurement program for adult oncology; and 84,38% of the contracted reagents. November 2016– delivered 100% of contracted medicines for the child oncology program; 100% of contracted medicines within the centralized procurement program for adult oncology for adult oncology; and 84,38% of the contracted reagents; and 100% of the contracted reagents. Read our brochure about our work in Ukraine which consists information about principles of the company, procurement project timeline, procurement process map and further report on results of the public procurement 2015. Crown Agents received an independent assessment of the results of deliveries in 2015 from Professor Prashant Yadav, Director of Healthcare Research at the William Davidson Institute at the University of Michigan, a globally recognized researcher, educator and policy advisor in the area of healthcare supply chains. 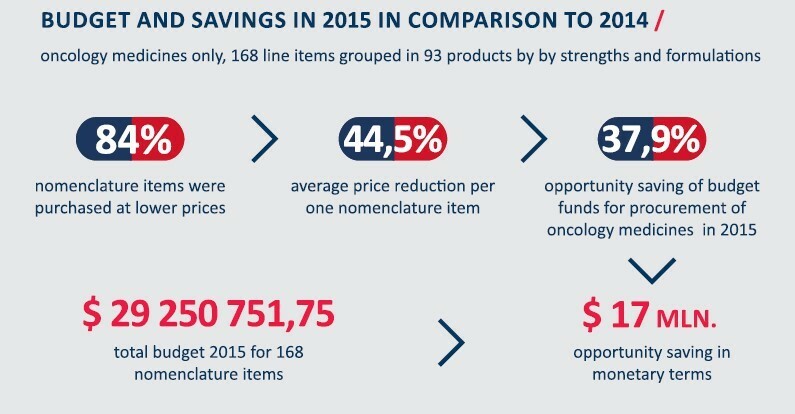 The conclusion of the study was that the net price to the Ministry of Health of Ukraine decreased by an average of 37.9% and approximately 84% of items procured had a lower net price in 2015 as compared to 2014.